A BIG Summer series for EVERYONE! Get ready to discover a tool that gives you access to a whole new world that combines everything from goal setting to adventure track to connecting with a bigger community--it's called Bullet Journaling. Bullet Journaling allows you to feel successful and artistic no matter what your level of creativity. Learn how to combine goals, exploration, and dreams on paper as a living document to create your biggest year yet. You will leave with a Bullet Journal that is set up and ready to go immediately after the workshop to support you in living your biggest, best life imaginable. You will develop tools and resources, and gain access to a community that will continue to share and keep the journey alive! Make this year your most fulfilled year yet! No matter where your birthday lands in 2018, this workshop will elevate YOUR year starting right NOW! 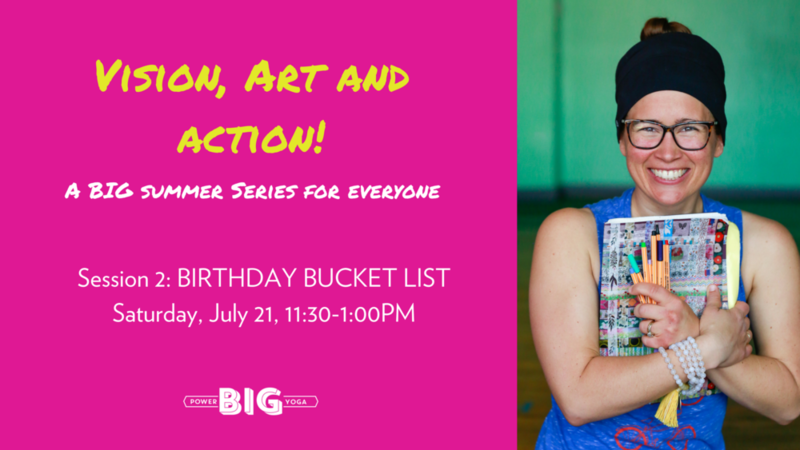 This workshop will not only assist you in creating a list of goals and achievements but also will give you the accountability you need to complete your bucket list throughout the year. Come learn the ins and outs of creating a list that is both doable yet challenging enough to create memories that will last a lifetime. Come craft, explore, and get a clear picture of your wildest year yet through creating a vision board with our BIG community. A vision board regularly allows you to reexamine your goals. Through selecting meaningful images and words, you will bring your unique vision to life. All art levels welcome on this journey! You will leave with a vision board that can be utilized daily to be the catalyst for living your dream life NOW. Come get clear on your wildest dreams.